Have you ever substituted whole wheat flour in this recipe? Also, could I use butter? ?– I am not a big fan of margarine? (will it make a difference in texture?) Just wondering? I have always wanted to make these rolls and hopefully I’ll get to it this week! My cousin used to visit the jail in Beaumont through his work with DPS and brought this recipe to my Mom many years ago. They are wonderful and have been a staple in our house at holidays for years! Hi my Name is penny and I am from the Beaumont Area. 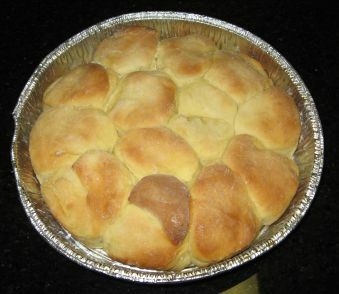 My mom use to make jailhouse rolls also. My Uncle you to be the custodian At the Beaumont courthouse for years. That is how we got the recipe.I am so glad that Your mom made them also as my mom passed away and I didnt have the recipe. Thank you for sharing this is the one that I needed. We use to make them for our patients in our Nursing home. My great grandma used to make these every holiday, thanksgiving and Christmas, up until she passed away last November. They were the very best. My grandma finally told me that they were called Jailhouse Rolls, and her mom got the recipe from some lady in Beaumont. So amazing that I found this recipe on here!! I will make these for Christmas and surprise everyone! They will be soo happy. I have to do a few test runs to make sure I get them just right. I am so glad I found this recipe and even better to know that it came from some one in Beaumont. My parents lived there for a long time and eventually moved to Houston. My mother use to make these for us and oh my gosh they were so good , but she had passed away several years back and i was never able to get this recipe. Do you make the instant mashed potatoes first and then add them to the recipe or do you just throw the flakes in and mix it? Those rolls look fantastic! You mix the instant potatoes according to the package directions first, but you could also use “real” (made from scratch) mashed potatoes, if you prefer, although it will give a slighter denser texture. Good luck! These rolls are, indeed, super yummy. We don’t have a holiday meal around here without them. I can’t believe I found this recipe! We lived in the Beaumont, Nederland area in the late 60’s to 1979 when we moved to Houston. I had this recipe and loved it. Over time and several moves I misplaced it. My family loved them. Fast forward to 2012, retired and living in Tennessee, while surfing the web I decided to try to find the potato rolls recipe. I hit it on the first try! Thank you for posting it. You really made my day. I used to work at the Beaumont Police Department. The woman who cooked at the city jail (sorry to say I can’t remember her name) used to make these rolls. Loved them, but lost the recipe. Thanks so much for posting this! Uh, I am trying this recipe today. It looked great until I added the yeast water. Now it looks like lumpy pancake batter. Is this too much water?? Wow my son-in-law posted this link to his Facebook page, I couldn’t believe it! My father was Captain H. Walling of the Beaumont, Tx police dept. he brought home this recipe one day when I was a little kid 1960’s my mom made these rolls every Thanksgiving and Christmas. I remember her telling me they were called jailhouse rolls because the cool in the jail made them. My dad told me that the prisoners got them on the Holidays, in fact I remember him saying that there were regulars whom always managed to get themselves picked up just for the rolls and hot meal ! Still make them now and then. Marie D. Don’t forget to refrigerate if still too doughy just add a little flour! My mother also made these. We’re from Beaumont, but she didn’t work at the jail. I don’t know where she got the recipe, but they were great. I never found her recipe after she died, but this looks about right. I’m going to try it. Can’t wait! !